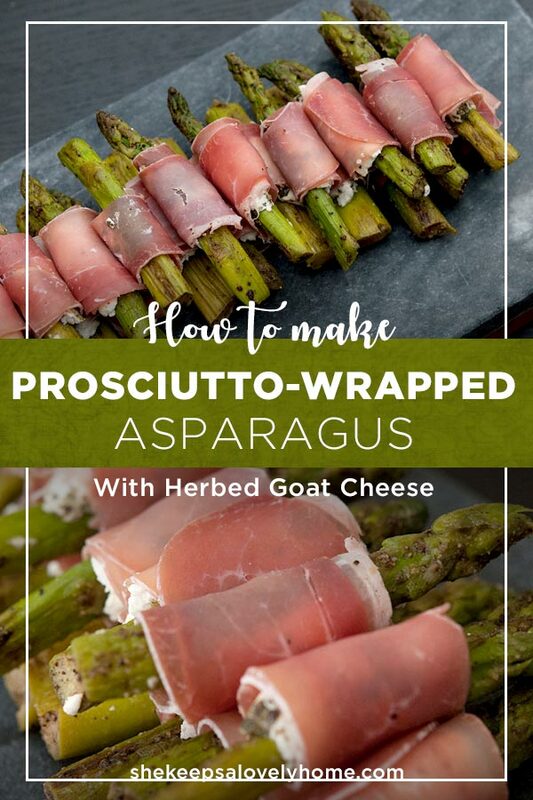 This delicious prosciutto wrapped asparagus with goat cheese is such an elegant party appetizer for any occasion. Try your best not to eat them all before your guests arrive! 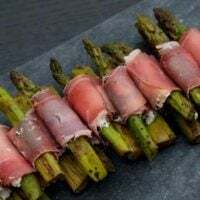 Like most of my favorite party appetizers and side dishes, prosciutto-wrapped asparagus can be made a day ahead, so you have more time to concentrate on tidying and prepping before your guests arrive. It’s a simple 3 step process. 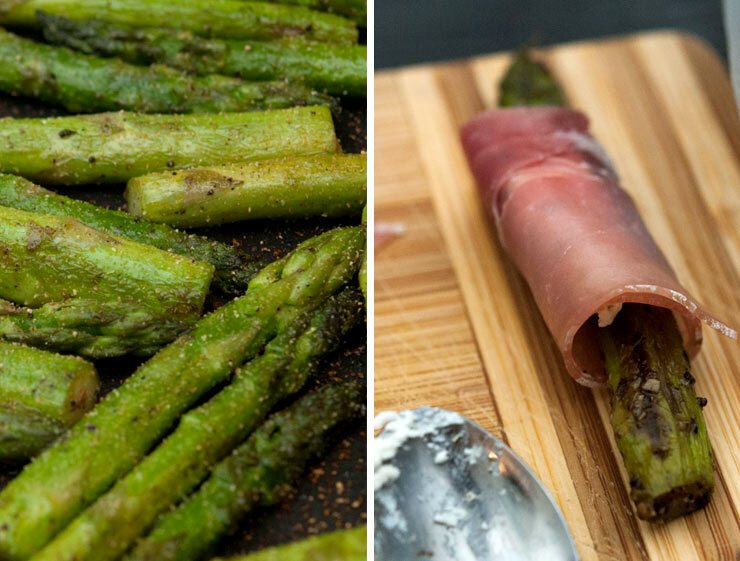 Cook asparagus, cool asparagus and wrap asparagus. When cooking the asparagus, make sure to sprinkle your garlic powder just as your asparagus is nicely browned and toss in the pan for only about 30 seconds, then remove from heat. If you add the garlic powder too soon, it will just over-cook and burn in the pan. The rolling process is a little time consuming, but so worth it! Simply cut your prosciutto into 4ths with kitchen scissors, add a nice dollop of goat cheese and roll. 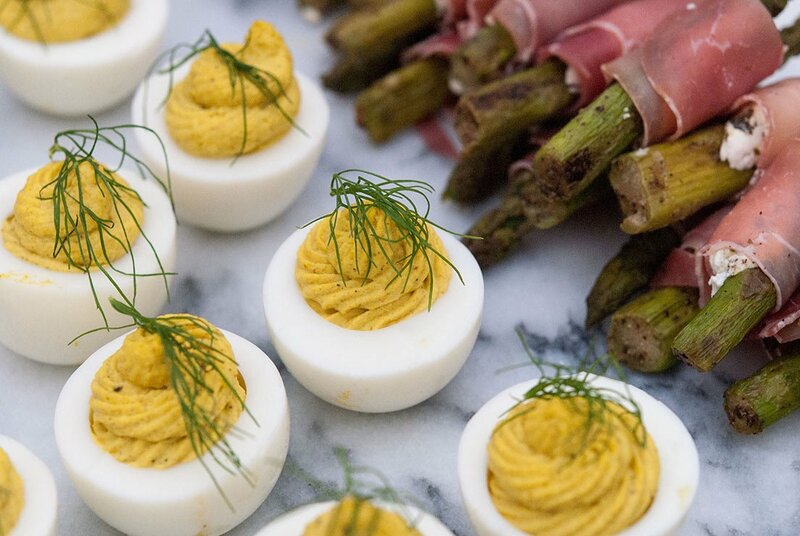 I love serving prosciutto-wrapped asparagus on a marble slate with deviled eggs. They just look so, so pretty together. 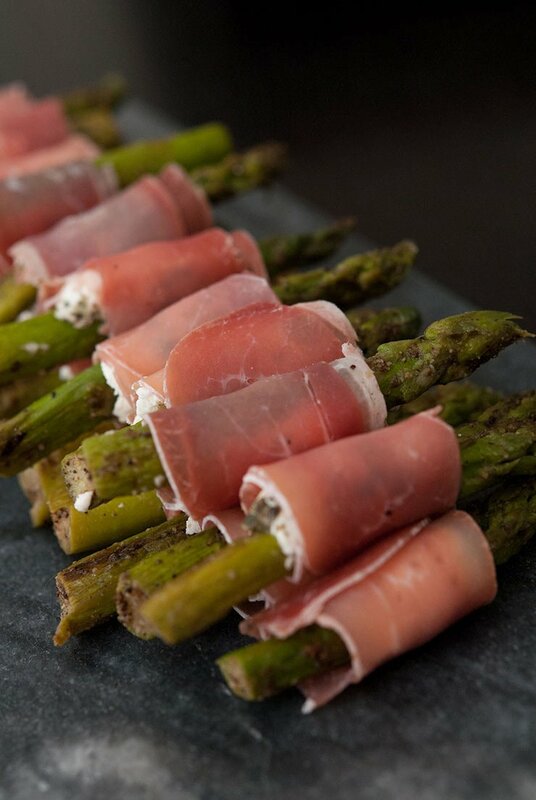 A savory, bite-size appetizer with perfectly pan-cooked asparagus, prosciutto, and herbed goat cheese. 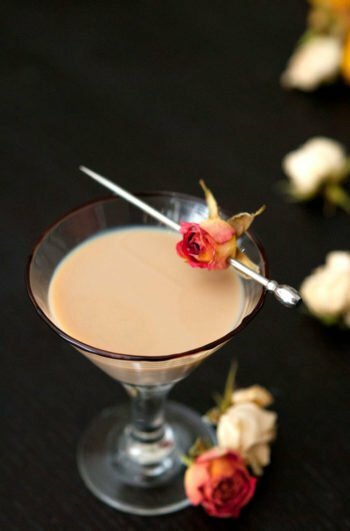 You'll require a frying pan for this recipe. Wash and chop your asparagus into bite size pieces for appetizers, or leave them whole for a side dish. Add tbsp. of butter to pan and sautée asparagus till slightly brown, about 5-8 minutes. Then season with garlic powder, salt and pepper till nicely brown on a few sides, 2-3 minutes. Remove from pan and store in the fridge till cool, about 2-3 hours. 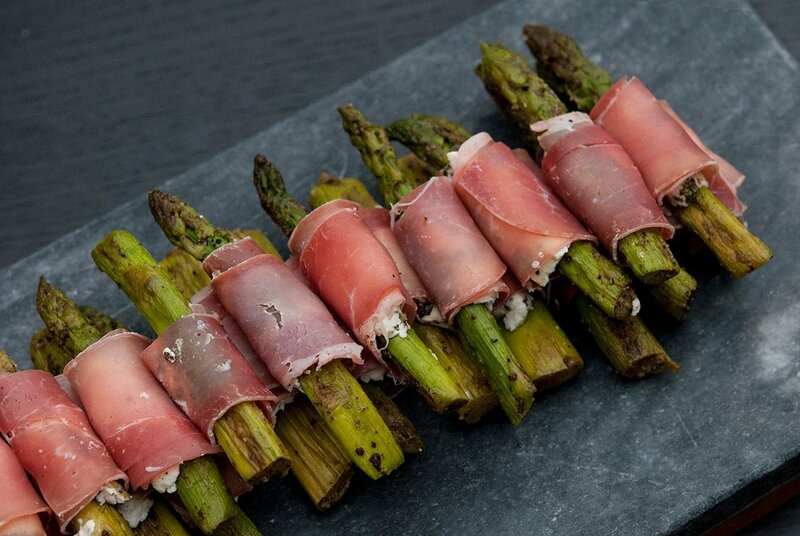 Once asparagus is cool, use kitchen scissors to cut the prosciutto into smaller, pieces. For small pieces like I've made, I cut a piece into 4ths. Spoon a little goat cheese onto your prosciutto and wrap each piece. 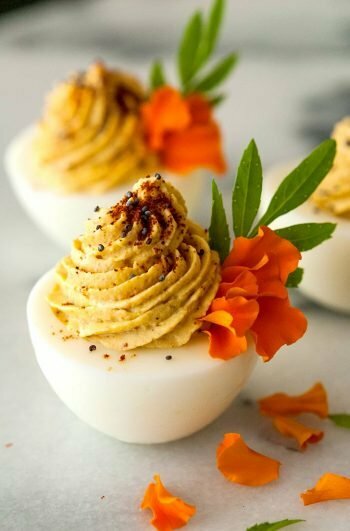 Looking for some more appetizer inspiration?